Chipmunks are territorial. Males and females live apart rather than in communal burrows. All chipmunks have four toes on the front feet and five toes on the hind feet. 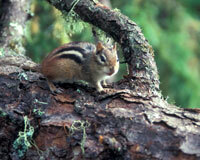 There are at least 22 species of chipmunks across the lower 48. 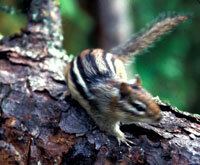 The eastern chipmunk covers most of the eastern portion of the country and the eastern portion of Canada. The cliff, Merriam’s, gray-collared, yellow-pine, least, Townsend’s and the Colorado are located in the west and western Canada. (These are the most common.) They all are of different colorings but are about the same size, looking much like a miniature squirrel (they belong to the same family). They pack their cheeks with nuts, seeds or grain and use the front feet to squeeze out the pouches of food, mostly underground in their storage area. They then build a nest beside the food cache. Unlike other hibernating animals, the chippies wake up in the winter, down some C rations, and goes back to bed. 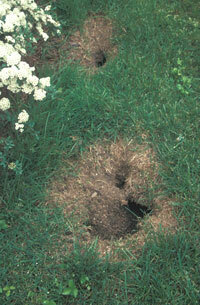 They live in the same burrow for several years, extending the length up to 30 feet. They develop branching tunnels, alternate exits and extra chambers. They plug the openings when cold weather arrives to keep out the cold. Males court in early spring and again in early summer. The babies are born 32 days later and in six months are above ground and feeding on your fare. In most home landscapes, the chipmunk is not going to be considered a pest, but rather a cute little member of the family. It is only when the chipmunk population gets too numerous and when damage to your plants is obviously caused by the critters that they shift their status from family to pest. Therefore we suggest that your strategy in dealing with chipmunks should be to reduce the current population to a level where you can again live together on the same property in harmony. We believe that aggravating enough chipmunks using multiple repellents is preferable to killing them. But the choice is yours. To aggravate them you need to insult three or more of their basic senses (taste, smell, sight, sound, etc.) changing the target sense every two or three weeks. If for three weeks they are hit with a bad smell repellent, and then two weeks later, just as they are getting used to the smell you hit them with a bad taste repellent, they can become aggravated. Alternate taste and smell, or go with taste, smell, and a repellent with a burning sensation. Chippies feed on berries, mushrooms, seeds, worms, insects (caterpillars and grasshoppers) and garden bulbs. They have a keen sense of smell and a strong sense of curiosity. When you are putting out bulbs or new transplants, your scent is transferred to plants, bulbs or seeds planted in the chipmunks territory. The chipmunk feels its territory has been invaded, but is also curious so it digs up the plant or bulb. So the damage to the flower bed is as much a function of curiosity and territorial imperative as it is a function of food for the critter. Chipmunks also love fresh strawberries, so watch out for them in the berry patch.